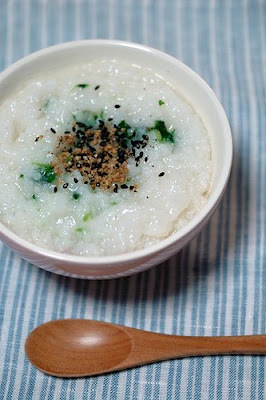 For many families in Asia, a typical day begins with a bowl of jook, or rice porridge. Oftentimes, vendors with pots suspended from the ends of bamboo poles haul the hot meal right to the front door. Although rice porridge comes from humble beginnings, today it is served with a variety of exotic toppings, ranging from sliced raw fish (as here) to thousand-year eggs, or bite-size balls of ground fish or meat. It's especially good for the sick ones, in case you catch the flu, you could add some ginger in it, which could improve your condition, yup, sounds magic, but it's true. The water quantity that added when boiling this rice porridge is depending on you. It needs time, at least half hours, so you could get a little ealier to prepare this, but it would gonna deserve it. So not with too much oily stuff in the morning and there is vegetables and water, very healthy and great for breakfast, you could also add one egg to the recipe.